DRE have been supplying Towed Spreaders for over 20 years. The Broadcast Spreader are supplied from our workshop situated in Bunclody Co.Wexford Ireland, at the Wexford, Carlow and Wicklow borders. 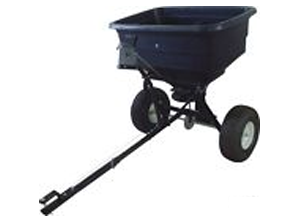 Our CT2211 Towed Broadcast Garden Spreader / Seeder has an excellent load capacity of 175LBS / 80kg combined with a spreading width of up to 12 feet. Easy hand control via a lever and fitted with a pin-type draw bar and 14.2" wheels. Ideal for spreading salt and can also spread grass seed, fertiliser, loam or sand and animal feed/pellets. These come new and boxed with a next working day delivery or can be collected during normal working hours. You can call and pay direct over the phone.